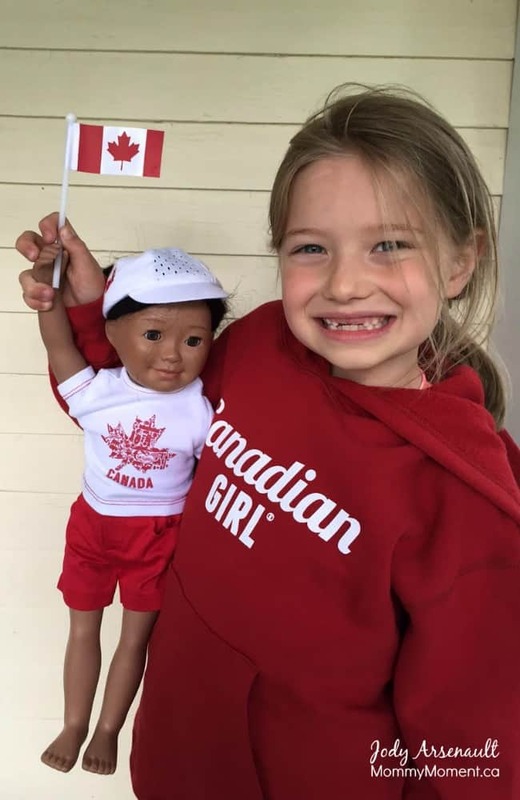 Canada day will be here before we know it and my girls will be ready to celebrate the big day with their Maplelea dolls Taryn & Saila! This Canada Day, we will be going to a local mennonite museum, my daughters are excited to bring their dolls and share the experience with them. Julia often talks about wanting to go to banff one day because that is where her doll is from. 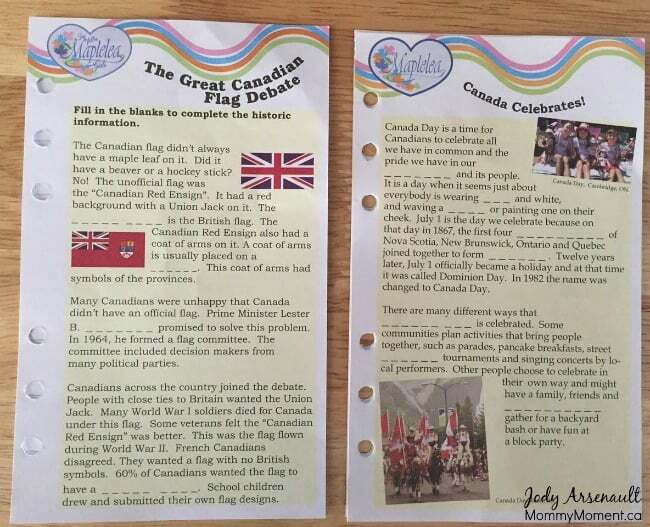 It is neat to see my girls learn about other places across Canada because of their wonderful friends, the Maplelea Girls. My daughters love playing with their dolls. I love that not only are Maplelea dolls fun, but also educational. When you buy a doll, it comes with a journal about the doll and a section for the child to fill out as well. Every doll outfit you purchase comes with new journal pages. My daughters are each wearing the red Strong and Free Sweatshirt. Taryn is wearing Strong and Free doll outfit and Saila is wearing the Canada Day outfit for dolls. Each doll outfit came with it’s own journal page. 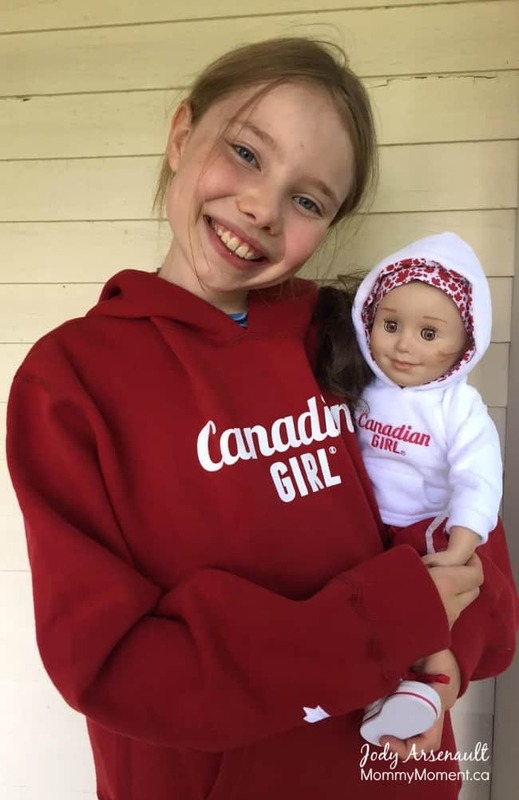 One lucky Canadian Mommy Moment reader will win an outfit for a child and doll – the prize is a Maplelea Girls Strong and Free Sweatshirt (in red or white) along with a Strong and Free doll outfit. To enter to win, visit Maplelea and leave a blog post comment telling us which of the Maplelea Girls is your favorite. My favourite Maplea Doll is Alexi. My daughters favorite doll is Saila!! I think Alexi has a sweet face.Thanks for the chance! I really like the Taryn doll. Taryn is my favourite Maplelea doll. I like that she is from Banff as we lived in Alberta! Thank you! KMF10 doll is my fav. Jenna is my favourite, closely followed by Leonie. I would have to say my favourite is Jenna, but they are all sweet!! I like the Léonie doll. Jenna!! Mostly because we have our own little Jenna in our home! My favourite doll is Taryn, she is beautiful! I love Jenna as she has red hair just like my Grandaughter! Jenna is my favourite doll! I like Jenna from Nova Scotia where my grandchildren were born. My favourite doll is Saila but my daughter’s is Leonie! I like Jenna, as my daughter is red headed. I like Jenna because the comfortable outfit and ready to go type of girl reminds me of my daugther. I think that my girls would like Jenna. Visited Maplelea.ca & of the Maplelea girls Saila my favorite. I liked one of the Maplelea friend best but since she didn’t have a name … my second favorite was Taryn. Cute dolls! Our favourite doll is Leonie. Taryn is cute. I also like the dolls that you can pick the eye/hair color and hair length to resemble your child. I like Jenna because she reminds me of my granddaughter who loves gymnastics and softball. I can’t find the spot to comment on on of your article on Dress with Confidence so I’m putting it here. The tips that are made are made are great advice. They would go a long way to making me feel good about dressing for the day. I like Leonie and The KMF11 – Maplelea Friend with short curly hair is a favourite. Jenna is my daughters favourite, she takes her everywhere. Leonie is my favourite. She has so much style and I love that she is from Quebec.